Carefully crafted and filmed, this episode is emotional from the beginning to end, starting off with Chandler’s sudden death. It goes on with describing the process of how the “The Funny One” tries to accept his death and how devastated the gang is over his unexpected demise. 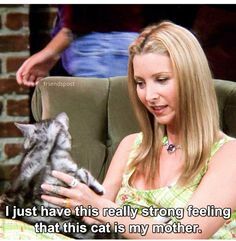 All of Chandler’s efforts to reach out to his friends on the other side would have been vain, if not for Phoebe’s psychic ability to feel the presence of his ghost. The gang then perform a ritual to summon Chandler back, and well does he go back. As you can see, I’m not the best at rating or reviewing movies (because I’m not Trevor J), but as an up-and-coming Friends devotee (three seasons throughout two weeks of Z Block with Joel), I hope my devoutness is accepted and my opinion is valued when it comes to such an icon of a TV series. My humble opinion is that THIS EPISODE IS ONE OF THE BEST FRIENDS EPISODES EVER DON’T EVEN FIGHT ME and it is really worth a try if you are in your Friends-reminiscing set of mind and not in the mood of rewatching 236 episodes. 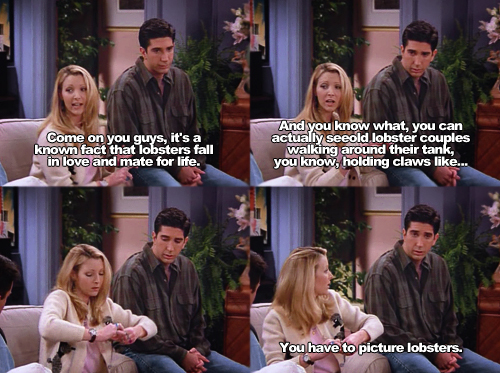 I do believe this is the lobster for every Friends fan.